Friday February 5th 1904 It was a fine day. They got the hogs away all right and the boys were back for dinner. Will took me down home in the afternoon it has thawed till it is very slippery. Mollie went home. Wills 37 hogs brought $342.45. I read in evening. Saturday February 6th 1904 It was like summer time. We hardly needed fire in the house. The ice left the ground today where it has been for more than two weeks. I finished my dressing sacque by noon and after dinner washed out a few things and ironed them with my washing that was sent home. I did some mending in the evening. 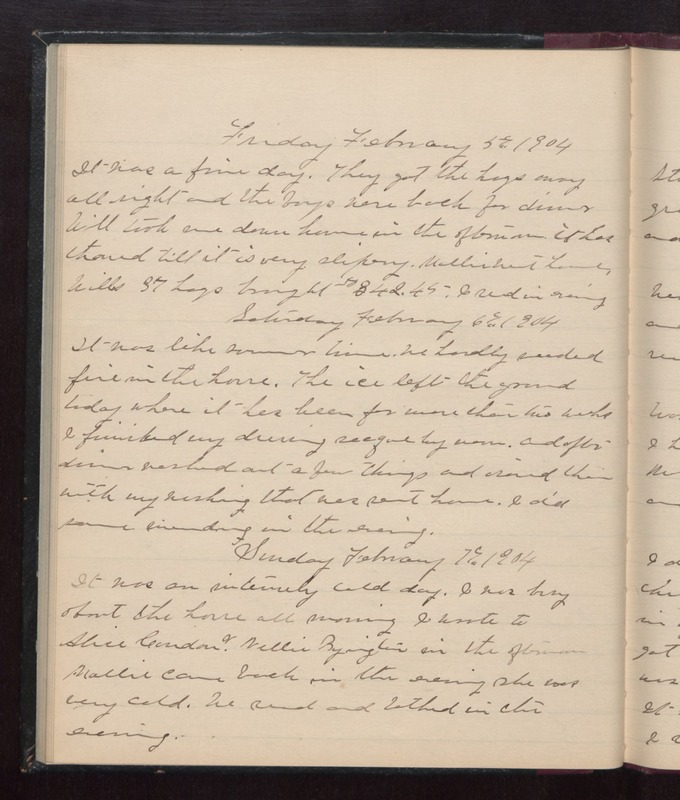 Sunday February 7th 1904 It was an intensely cold day. I was busy about the house all morning. I wrote to Alice Condon & Nellie Byington in the afternoon. Mollie came back in the evening. she was very cold. We red and talked in the evening.